If you own a Samsung Galaxy Note 8, and you haven't bought a protective case for it yet, you could consider getting a clear / transparent case. Whether they're fully, or partially transparent, these cases don't change the aspect of the Galaxy Note 8 too much, so they're perfect if you want to preserve the phone's original style. Clear cases also offer at least some basic protection (depending on model), though you should obviously not expect them to be as tough as some heavy duty rugged cases. All the clear Galaxy Note 8 cases that we're showcasing here are compatible with wireless charging, and do not interfere with the phone's ports, nor with the ability to use its stylus. The cases are listed in alphabetical order. Enjoy! The Caseology Skyfall is a one-piece case made out of TPU (Thermoplastic polyurethane) and polycarbonate. It provides all-around protection thanks to an impact-resistant frame and raised lips that keep the screen of your Samsung Galaxy Note 8 safe. This is not a fully transparent case, as its frame is colored. However, the frame can match the original colors of the Galaxy Note 8 (black, gold, blue coral, and orchid gray), so the phone will look good anyway. The i-Blason Magma is another impact-resistant Galaxy Note 8 case that's only partially clear. Comprised of a hard front bumper and a scratch-resistant, transparent rear, the case comes with a couple of extras that aren't available on any other product presented here: a built-in screen protector (which can be taken off and reinstalled when needed), and a belt clip holster (this, too, can be attached and detached at will). The i-Blason Magma clear case for Samsung Galaxy Note 8 is available in five color variants - black, metallic blue, metallic green, gold, and rose gold. The simplest and thinnest clear case for the Galaxy Note 8 comes from Samsung itself. The company designed this case with minimalism in mind, which means your Galaxy Note 8 and its near-bezel-less display can truly stand out when wearing it. Made out of plastic, the case is barely noticeable when installed. It still provides edge-to-edge protection, though it seems to be less protective than all the other options on this list. Thin, flexible, and almost fully transparent, this Spigen Rugged Crystal case features corners with air cushion technology, ensuring that your Samsung Galaxy Note 8 stays safe when you drop it like it's hot. The non-slip, rubberized material of the Spigen case (which, by the way, is the cheapest on our list) makes it easy to hold, and adds to its value. The VRS Design Crystal Bumper case for Samsung Galaxy Note 8 is a two-piece product that has a subtle elegance and will fit excellently on your phone. 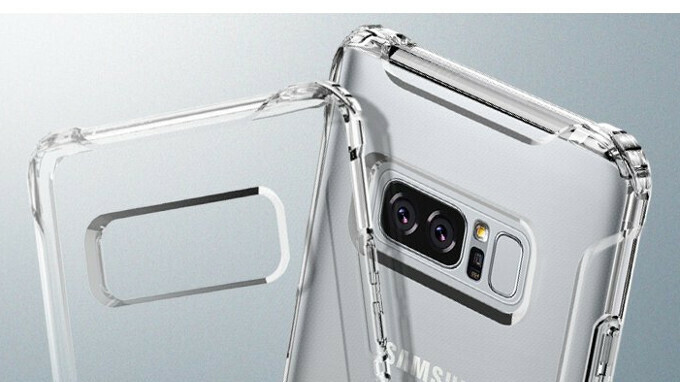 While providing protection against drops and scratches, the case will also allow the design of the Galaxy Note 8 to shine through. Perhaps the only gripe we have with the VRS Design Crystal Bumper case is that it's a bit on the expensive side. But, hey, at least you can get it in no less than six color variants - metallic black, orchid gray, satin silver, shine gold, blue coral, and deep sea blue.